Description: Classic lace motifs and Swarovski crystals dance over the bodice of this fit-and-flare wedding gown, drifting into the tulle skirt. 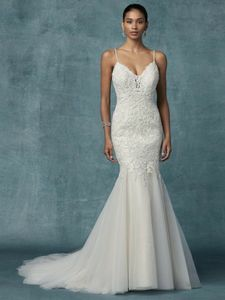 Beaded spaghetti straps glide from plunging illusion sweetheart neckline and illusion scoop back, both accented in lace motifs. Finished with covered buttons over zipper closure.